Trek and explore Europe’s most majestic mountains. You’ve seen the iconic image of the Matterhorn and know Mont Blanc as the highest peak in the Alps – now, it is your time to personally experience Europe’s breathtaking mountains on our rugged, 20-day Alps Explorer. 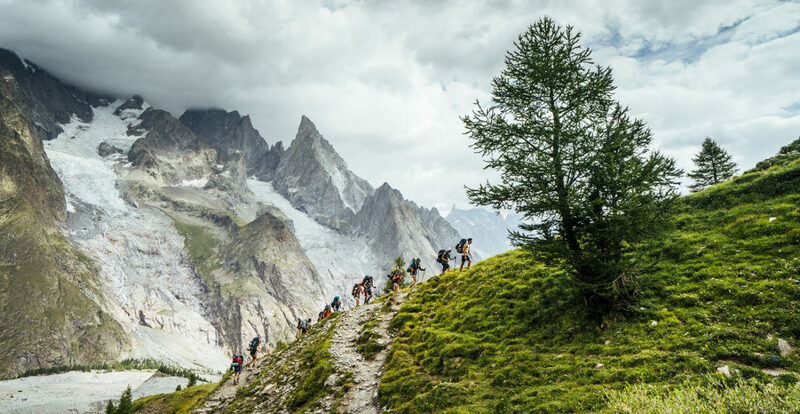 Starting in Zermatt, Switzerland, you’ll hike winding trails to Alpine huts and take in the stunning beauty of the Matterhorn towering overhead. 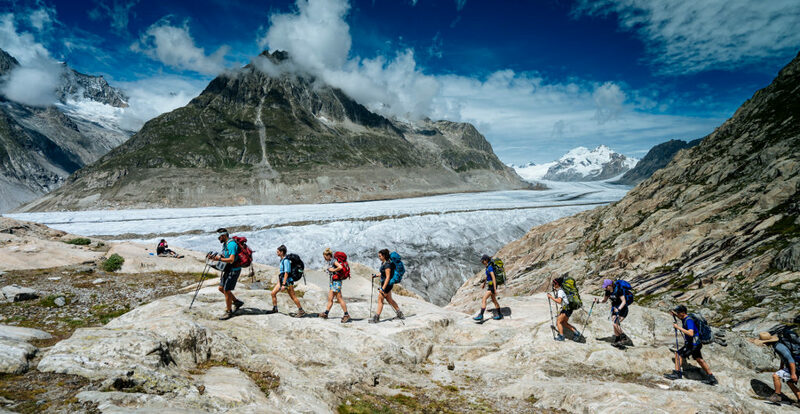 After a spectacular day-hike along the Aletsch Glacier, Europe’s largest, you’ll set out on the world-famous Tour du Mont Blanc. This twelve-day, three-country hike will take you around the highest mountain in Europe, provide more postcard-perfect views than one can count, and have you ordering caffè in Italian, croissants in French, and rösti in German. As a grand finale, you’ll head to the sparkling, world-class city of Geneva for a morning of community service before it’s time to relax and celebrate your many Alpine adventures. Arriving into Geneva’s International Airport, we’ll transfer directly to the town of Zermatt in Switzerland’s picturesque Valais region. Using Zermatt and its flower-box filled streets as our base, we’ll spend our first few days hiking in the shadow of the world-famous Matterhorn. Climbing out of the valley and up above tree-line, we’ll feel the burn of a tough climb, but be more than adequately rewarded by cool Alpine air and striking views of the Matterhorn and its neighboring mountains. From Zermatt, we’ll transfer to the small, riverside town of Fiesch. One of Switzerland’s famous cable cars will carry us up to the high plateau that is home to the Aletsch Glacier. We’ll hike the length of this magnificent glacier to the car-free mountaintop village of Bettermeralp, and then descend back into Fiesch. From there we’ll transfer to the city of Martigny at the foot of Mont Blanc. In Martigny, we’ll take a day to catch our breath and get geared up for the days to come. Well-provisioned, we’ll set off on the full Tour du Mont Blanc. We’ll travel ancient footpaths through quiet valleys, climb high mountain passes, bask in unending Alpine vistas, and cross international borders – all on foot! Trekking into France, we’ll be surprised by the hustle and bustle of the resort town of Chamonix before crossing into Italy and the small town of Courmayeur. You can be sure that we’ll take time to pause for a real Italian pizza before crossing back into Switzerland and relishing the last leg of our trek. The Tour du Mont Blanc offers an amazing taste of three distinct Alpine cultures. Upon completion, we’ll know first-hand the common threads of the region and will savour the wonderful differences that make each place unique. We’ll spend our final day together in the historic, proud and beautiful city of Geneva. After a morning of working in the Geneva Botanical Gardens, the rest of the day is ours to experience the city. The famous, high-shooting Jet d’Eau water fountain will punctuate our celebration as we explore the city and reflect on the many highlights of our unforgettable journey. Please see our General FAQ page for many more frequently asked questions and answers! How physically challenging is AX? Given a Challenge Level 8 (out of a maximum of 10), we consider AX to be an advanced hiking trip. We believe that any moderately fit, motivated student can successfully complete this trip with appropriate preparation. Compared to similar hiking trips, we believe that AX is more challenging than our Pyrenees Mountains & Coast trip due to the trip length and total mileage covered. The group will hike up to 15 miles on their most challenging day, while their daily mileage typically spans between 9-12 miles. Please note that all of Apogee’s Challenge Levels are not scientific and are subjectively calculated by the Apogee staff. Where will my child be sleeping at night? Our AX groups will be camping for 14 of the 19 nights over the course of our trip, and each of those nights will be spend in established, front country campsites. We’ll spend the other five nights of the trip indoors (three nights in mountain hostels called rifuges or rifugios and two nights in a Geneva hostel). Leaders will separate students by gender into tent groups, and will rotate those groups several times over the course of our trip. Students will share a tent with one or two other students. What is the difference between front country and backcountry hiking? What will the backcountry portion of AX be like? How much weight will my child carry during this portion? Generally speaking, the front country is any area that is easily accessible by vehicles and day users. Hiking in the backcountry, on the other hand, involves hiking and camping in more remote locations without running water. Hiking and camping in the backcountry requires more preparation, because of the need to pack all food and gear. 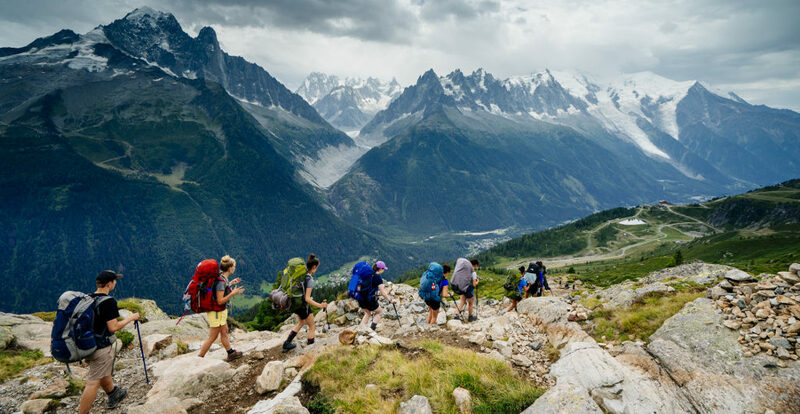 Our AX groups will be carrying several days worth of food and all of their equipment on a point-to-point-style hike during the two-week Tour du Mont Blanc (TMB), so in that respect they are backcountry hiking. However, very few portions of the TMB are truly remote; our groups will be passing through towns and settlements on a near daily basis. That said, there are portions that will be rugged and not accessible to auto traffic. Your child will be carrying their personal gear (sleeping bag and pad, clothing essentials, personal toiletries) along with their allotted portion of group gear and food. For the most extended portion of hiking on our AX trip, your child should expect to be carrying between 25 and 40 pounds in their pack. How often will my child call home? Parents can expect a phone call home once a week on AX, usually corresponding with the group’s rest days. Students will also call home at some point on arrival day, depending on schedules and arrival times. What does the community service portion of this trip entail? We’ve discovered over the years that consistent, short-term volunteering partnerships are rarer in Europe than they are in the United States. While we cannot guarantee community service hours for students on AX, the majority of trips in the past have worked for 2-4 hours on a half-day beautification project in the Geneva Botanical Gardens on our last full day together. This trip starts outside of the United States. What do I need to know before traveling internationally? In addition to needing a valid passport, we encourage you to coordinate travel with other attendees. To that end, we’re happy to put you in touch with other enrolled families from your region. Please note that Apogee staff members do not travel with students; our trip leaders will already be in Geneva on arrival day and will stay in Geneva after the trip ends. Apogee staff and trip leaders will have a detailed flight itinerary for each student and will be at the airport to greet them on arrival; our staff will also accompany students to the airport to assist with departures. We will provide enrolled families with a Travel Information document covering details specific to traveling to and from Geneva, including airport information and arrival and departure time windows. We know that international travel can be daunting – rest assured that regardless of flight cancellations or delays, we will always have someone on hand to assist with our students’ arrivals and departures. Aside from the trip cost, what are the additional expenses for this trip? Apogee’s tuition costs are meant to be all-inclusive and include all meal, accommodation, and activity fees. 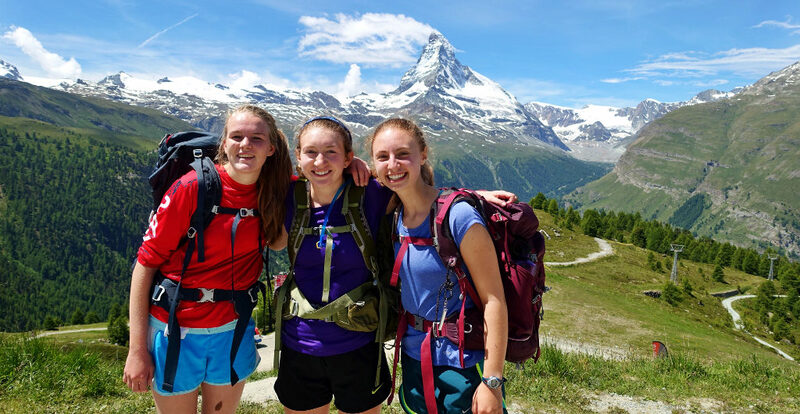 The most significant additional expenses on our Alps Explorer trip will include travel to and from Geneva, Switzerland, a sleeping bag and sleeping pad, a backpacking pack, and hiking boots. To check trip availability, please call 207.725.7025, or email info@apogeeadventures.com for more information.